I usually try to feature one great video blog a week. Which is to say I try to limit myself, but it's getting harder and harder. This week I knew I'd met my match when I saw Rocketboom's special feature. 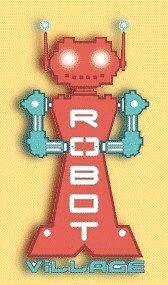 In it Amanda Congdon interviews the owner of a small robotics shop in NY called Robot Village. All I can say is, I heart my geek culture. Next time I'm in NY this place is number one on my hit list. I just love that places like this exist. I'm one of those kids whose favorite store in his hometown growing up was the local hobby shop. Sadly enough it's gone now. :( ...but I still hope you enjoy this video as much as I did.